our new puzzles have arrived and sam is busily at work building and dismantling them. it's interesting to see him put them together. half the time he looks as though he's not even thinking about it, and other times he's clearly trying to work out where something belongs, or what orientation it needs to be in. i wasn't sure how he'd do with the 24 piece puzzles, but he breezed through them both pretty quickly. he's definitely starting to remind me of his cousin tyler, who apparently used to sit with a couple of puzzles dumped in front of him, and would put together three or four at once. he's still one of the best puzzlers i know. 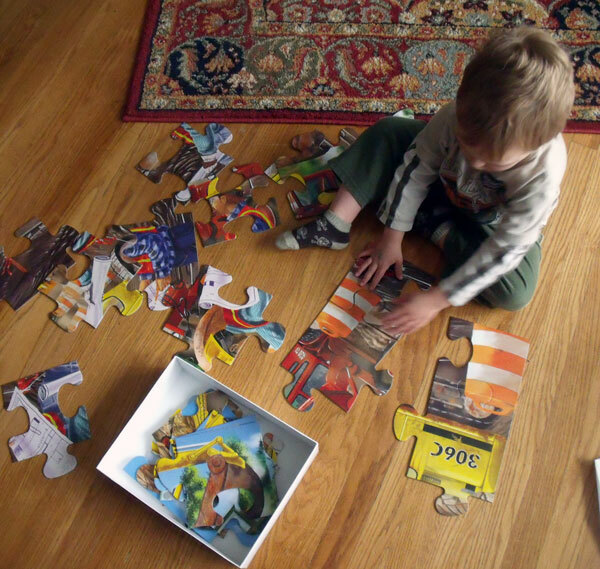 in any case, i'm going to encourage this willingness to puzzle away as best i can (and not just because it tends to be a wonderfully QUIET activity—no imaginary swords or bad guys involved)!